The Primitive Baptist Church was not known as a startlingly pro­gressive organization They usually had monthly preaching appointments instead of weekly services—were against missionary organizations believing it to be against “the Word of God” and preached a predestinarian gospel They were also known as Two—Seed, Hard-shell and Anti—Missionary and a preacher was not much who could not be heard a country mile. To this church Abraham Lincoln’s parents held membership while residing in Indiana. lived 2 miles NE of Winterset in 1847. Charter members were: Aquilla Smith, Sally Ann Mills, Samuel Crawford, Polly Crawford, John Butler, Susannah Butler, Mathew Jones, Lucinda Jones, L. D. Skidmore, Rebecca Thornburg and Lydia Evans. The first meetings were held in homes and soon as many as 50 were attending. All records were destroyed November 7, 1897 when the house of the church clerk, Asa B. Smith, was destroyed by fire. The first wedding in the County took place June 1, 1846. John Butler was father of the bride and his daughter Betsy Butler married Daniel Chenowith. Her father didn’t have their cabin up yet so they were married out in the timber. John Evans also preached at the Buffalo Center community south of town baptizing converts in Middle River. Evans was a great uncle of Inez Hartman, Ed’s first teacher. He moved to Nebraska from this area and died there. His was a large family and several of his ancestors still live in and around Winterset. One of his brothers built the stone house now owned by Charles Lee. Several relatives are buried in the Primitive Baptist Cemetery. In 1857 Evans sold his claim to Alfred Hood, reserving two acres where the present church and cemetery are, for that purpose. About 1859 a meeting house was started just east of the present one. It was ready for the plasterers when the Civil War broke out and the question of slavery entered the Church causing a division. In 1861 the Elder died and meetings were discontinued for a time. Later they were held at the Gorr Schoolhouse 9 miles NE of Winterset and near Buffalo Mill. Among the Elders at this time was an Elder Jordan. Meetings closed at Buffalo when the dam washed out by floods and the Mill closed down and members moved elsewhere in search of work. In 1903 Elder Jordan raised money and built a Church where the pre­sent one stands. 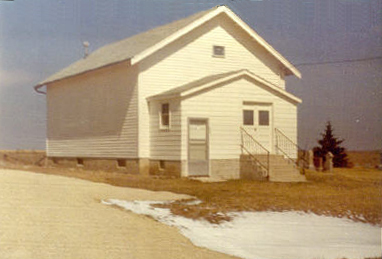 This building was badly damaged in the "Tileville cyclone” and again meetings were held at Buffalo Schoolhouse until money and plans were made available for rebuilding. About this time the membership became the largest in many years. Elder Jordan lived with and preached for the Church longer than any other minister.